Do you know what happens when you incorporate a few “typical” trail mix ingredients in a favorite banana cookie recipe? The result -a high fiber, antioxidant-rich and vegan cookie, that’s easy to make, chewy and moist. 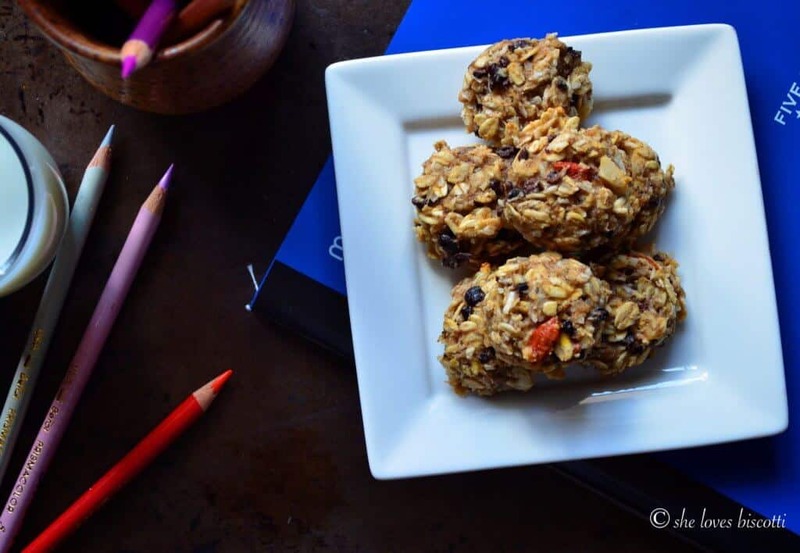 These One Bite Addictive Trail Mix Banana Cookies are the perfect after school snack. Recently, I received an invitation to participate in a Trail Mix recipe contest to help celebrate National Trail Mix Day held annually on August 31 (yup, I agree, there is a national day for everything!) I love trail mixes, so I jumped at the opportunity. Not too long ago, I wrote about the benefits of nuts, seeds and chocolate. Remember the Dark Chocolate Cranberry Almond Clusters I shared with all of you? Well, that recipe encompasses all of the components of a trail mix. What is a trail mix cookie? A trail mix is essentially a collection of dried fruit, grains and nuts eaten together. The use of the word “trail” would imply that there should be some hiking activity involved in order to consume this snack. But of course, trail mix (which will provide a healthy boost of energy) can be enjoyed regardless of whether or not you go hiking. Trail mixes are becoming extremely popular as part of breakfast bowls, made into no bake “bites”, bars or even in cookies. Today, I decided to incorporate two kinds of nuts -almonds and macadamia – along with cacao nibs, and the ever popular goji berries to my trustworthy banana cookie recipe. As an option, you can also add a third nut …a whole hazelnut to decorate each cookie. I have to tell you that I’ve been making this simple banana cookie recipe on and off for years- and every time I make it, it becomes a new recipe. Ingredients can easily be swapped with whatever you have in your pantry. Amounts can also be varied to suit your personal preference. If you are interested, the original recipe can be found here. Today’s result is an easy to make, chewy and moist treat -not to mention a high fiber and antioxidant-rich cookie! I hope you enjoy this recipe for these One Bite Addictive Trail Mix Banana Cookies. They make the perfect after school snack (by the way -they are also great if you are on a hiking trail 🙂 ). What recipe will you create? Would love to hear about it! 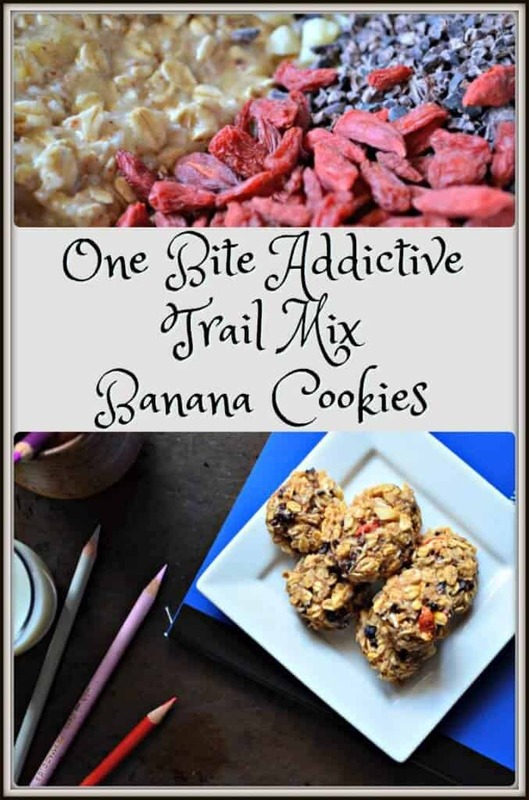 One Bite Addictive Trail Mix Banana Cookies -a high fiber, antioxidant-rich and vegan cookie, that's easy to make, chewy and moist.The perfect after school snack. In a medium size mixing bowl, combine the all the dry ingredients. Whisk together. Set aside. In a large mixing bowl, incorporate the mashed bananas with the vanilla extract and the coconut oil. Add the dry ingredients to the banana mixture and stir to combine. 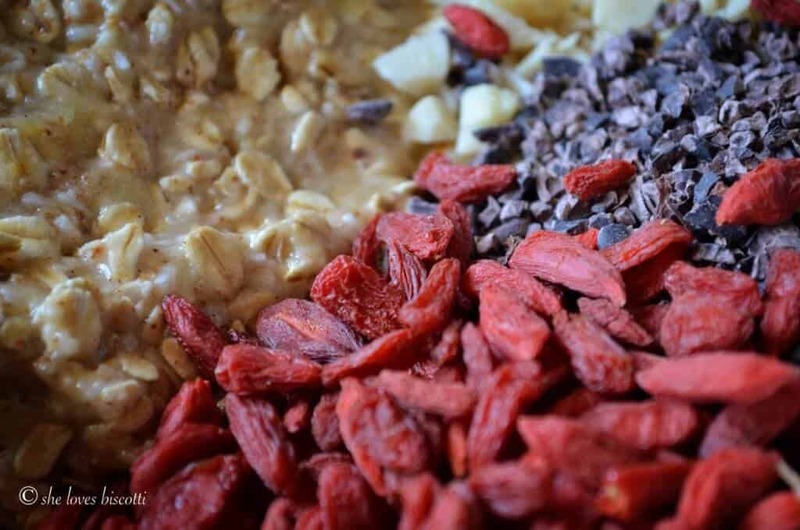 Fold in the cocoa nibs, goji berries, and the macadamia nuts. With a small sized scooper (about 1 tablespoon), scoop out dough and place on parchment lined cookie sheets. Place one hazelnut on each cookie (if using). With the back end of a fork, press down gently atop each cookie. I used Bob's Red Mill organic extra thick rolled oats. To make homemade ground almonds, just pulse almonds together in a food processor. I used cold pressed liquid coconut oil. Disclaimer: All opinions expressed in this post are entirely my own. No product or monetary compensation was received. Okay these sound spectacular! They are like the healthy cousin to the Monster Cookie! My favorite cookie is one that starts with oats! Looking forward to trying them soon. Seems like the perfect pre-or post workout snack. I’m always looking for something simple that will give me the boost I need. Love that I can change it up for whatever is in my pantry. Thanks. Absolutely! They also freeze well …that always helps with the quantity control:) Thanks for dropping by Deb!